When you stay at Natuga Ecolodge and Natural Reserve in Baru, you'll be in the mountains and within a 5-minute drive of Nauyaca Waterfalls. Featured amenities include express check-in, express check-out, and dry cleaning/laundry services. Free self parking is available onsite. With a stay at Casa del Sol Condominium in Potrero, you'll be near the beach, within a 15-minute drive of Flamingo Beach and Penca Beach. Free self parking is available onsite. Located in Drake Bay, Corcovado Adventures Tent Camp is by the sea, within a 10-minute drive of San Josecito Beach and Drake Bay Hiking Trailhead. The front desk is staffed during limited hours. With a stay at Cedrela Ecolodge in Copey, you'll be 20.6 mi (33.2 km) from Rio Savegre Waterfall and 24.4 mi (39.3 km) from Cerro de La Muerte Peak. Free self parking is available onsite. 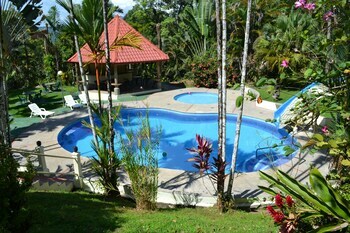 When you stay at Pachira Lodge in Tortuguero, you'll be on the riverwalk and steps from Tortuguero National Park. The front desk is staffed during limited hours. Located in Jaco, Apartotel Conchita is by the ocean, a 1-minute drive from Jaco Beach and 7 minutes from Rainforest Adventures Costa Rica Pacific Park. Free self parking is available onsite.